The best fish ever, and it’s no joke! You just have to try Pla Krapong Neung Ma Now. I know the name is already a mouthful, right!? I experienced this at Mango Tree Bistro in Trinoma Mall, Quezon City. It’s a casual fine dining restaurant serving authentic Thai cuisine. But before we go to the star of the show, let’s begin with the salads. Prawn Ceviche is a refreshing salad that packs a lot of heat! Subtle sweetness from the mangoes, and kick from the chopped chili. It’s made of prawns, ripe mangoes, cucumber, onions, cilantro, Thai fish sauce, chili, and lime juice. You can ask the server to adjust the level of heat depending on your preference. But I like this spicy. I also enjoyed Som Tum Chicharon. It’s tangy and spicy, and like the first salad, it also has that refreshing feel to it. 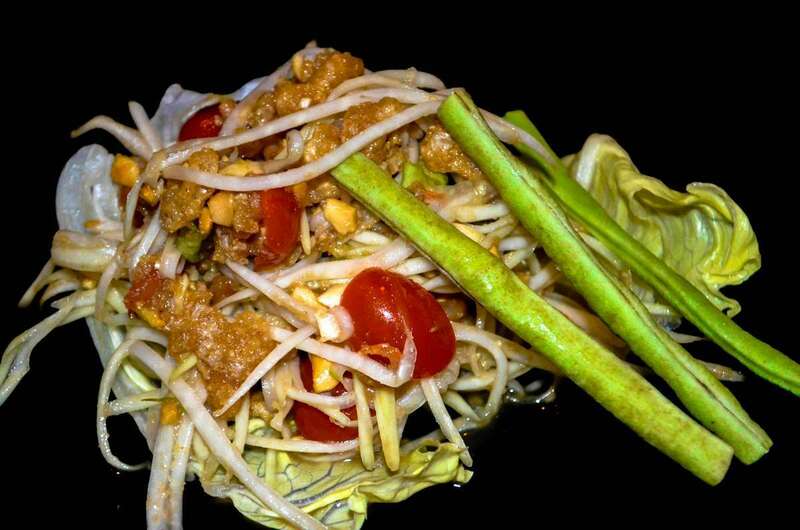 It has green papaya, string beans, lettuce, cherry tomatoes, dry roasted shrimps, pork rind (chicharon), chili, and peanuts. 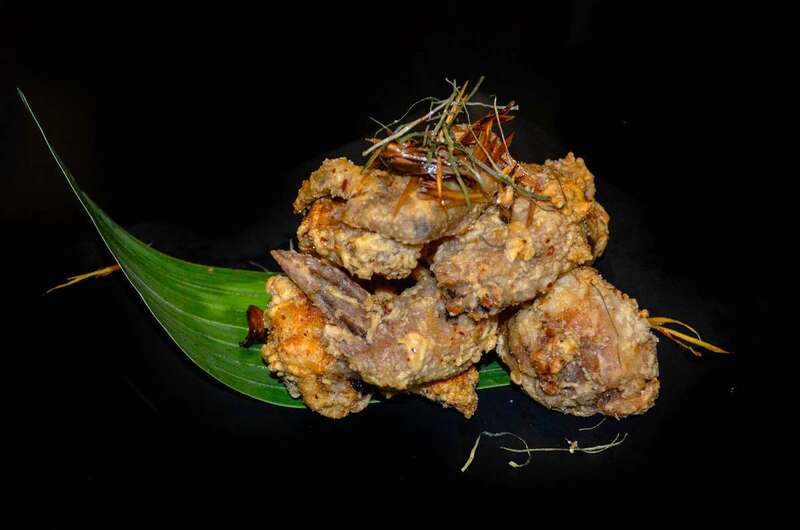 You can also try the Tom Yum Chicken Wings for starters. It’s deep fried chicken wings with tom yum powder and chili flakes. After the salads and appetizers, it’s time for the main meal. Chicken Prik Thai Dum is coated chicken fillet, stir-fried with black pepper sauce. The sauce settles at the bottom part of the dish so be sure to mix it well for the flavors to embrace each bite. 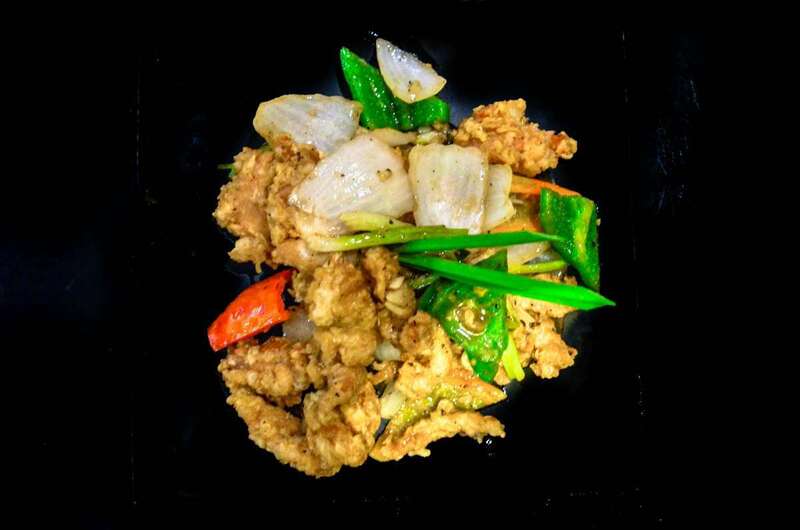 This dish is made of chicken, light soy sauce, oyster sauce, sesame oil, bell pepper, black pepper, garlic, and chili. 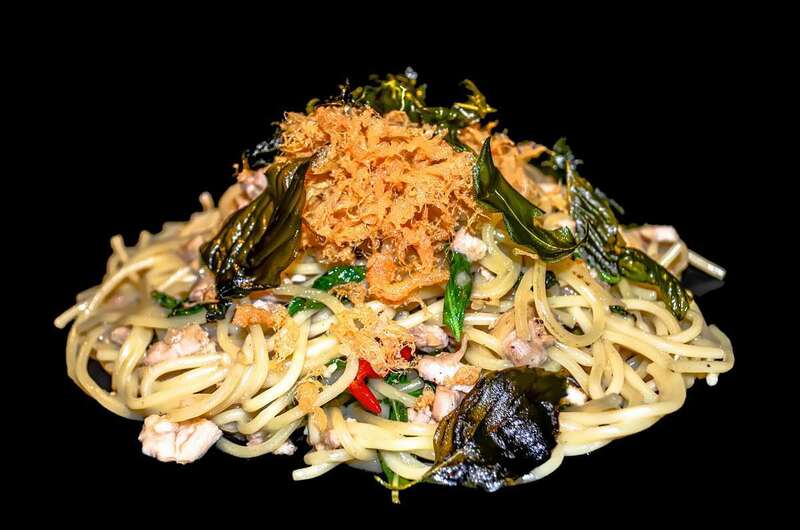 The chicken dish goes so well with Spaghetti Chicken Grapow. It’s light, and garlicky. It’s spaghetti with chicken, garlic, chili, basil, and light soy sauce. Now for the star of the dining experience, the Pla Krapong Neung Ma Now. 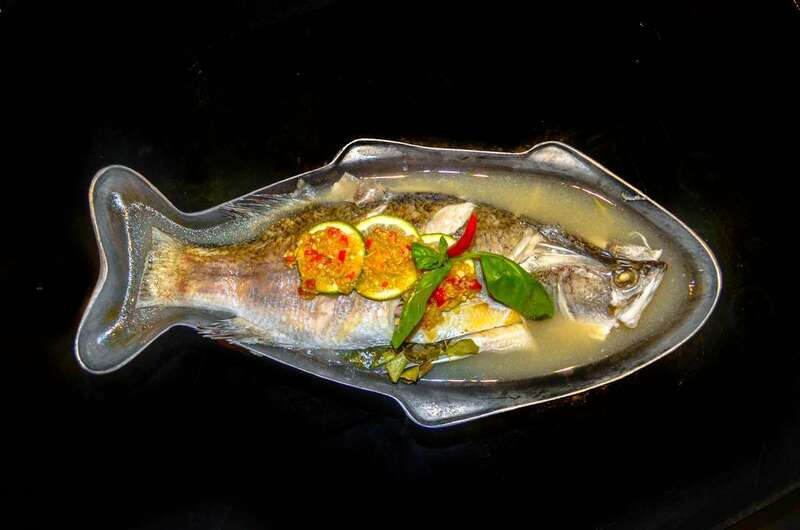 The sea bass is served in a tangy and tasty broth, with seafood chili sauce on the side. The broth bursts with refreshing flavors from lemongrass, lemon, galanggal (ginger family), kaffir lime leaves, and garlic. Smother the fish with the sauce that has a lot of garlic and chili. I highly recommend you try this. I enjoyed it even more with the extra helping of the seafood chili sauce. With all the spices, it’s best to cool down with their desserts. 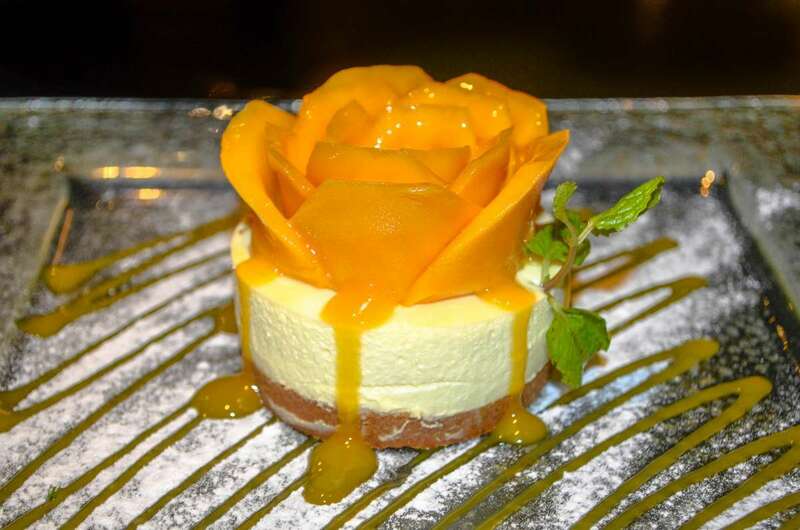 The Mango Cheesecake can definitely help temper down the heat. It has ripe mangoes arranged to look like a rose. It also has cream cheese, lime juice, mango sauce, and crushed grahams. The Thai Halo-Halo is another awesome dessert. It’s very rich and creamy because it has coconut milk, condensed milk, and macapuno ice cream. 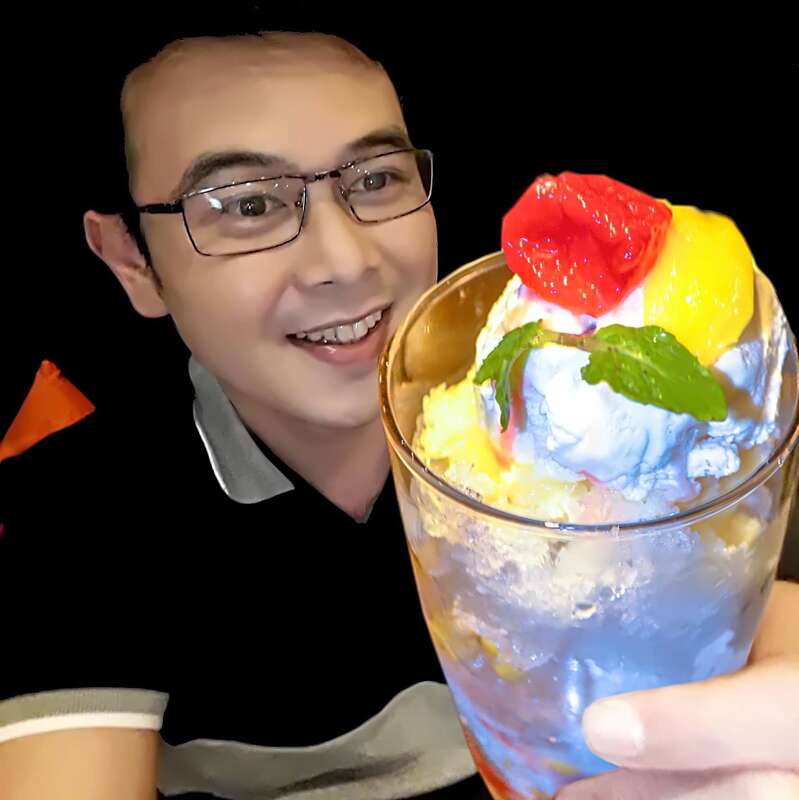 It’s also made of crushed ice, red ruby water chestnuts, sweetened saba, corn, and sago. 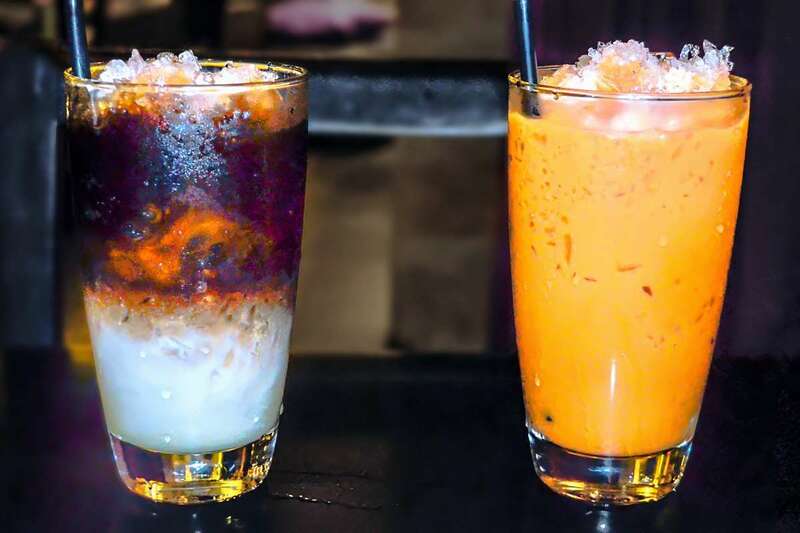 For drinks, I hope you try their Thai Iced Coffee (brewed Thai coffee, condensed milk, crushed ice) and Thai Iced Tea (Thai tea, milk, crushed ice). 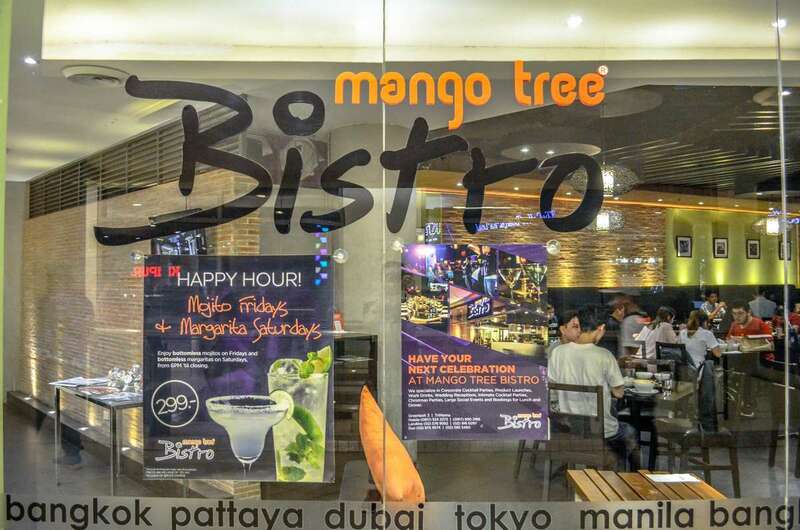 Thai cuisine is certainly one of the favorite cuisines of the world and world-renowned Thai restaurant Mango Tree has recently landed in Bonifacio High Street Central, Taguig. Mango Tree, being a casual fine dining restaurant, ensures every guest has their memorable experience with its Thai lifestyle cooking and warm hospitality. 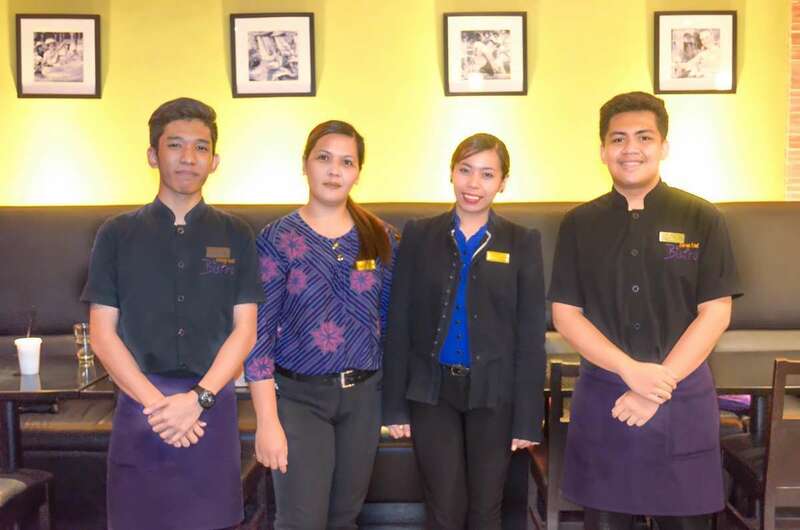 After the tremendous success of 2 previous outlets of Mango Tree Bistro in Quezon City and Makati City, Mother Spice Food Corp. unfurls the new Mango Tree with the memorable tagline, “Thai Cuisine at Its Best”, serving as the city’s new dining beacon subsequent to its popular outlets in Bangkok, Dubai, London, Tokyo, Hong Kong and Doha. Mango Tree ranks as a world-class restaurant with dedicated Thai traditions and hospitality and is ready to open its doors to welcoming guests with the freshest ingredients and incredible flavors. Headed by seasoned Chef Siwat Korsem with experience in Thai cuisine for over 27 years, Chef Korsem will continue Mango Tree’s vision of ensuring that every customer is satisfied with the complexity of tastes by using only the best and freshest ingredients, an array of nutritious Thai organic herb and spices and the cooking lifestyle that would spell an impeccable experience always. 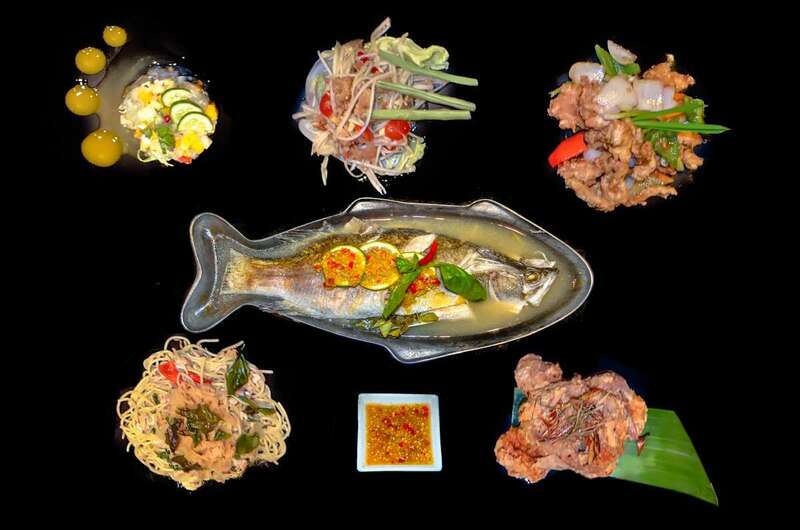 Mango Tree’s menu brings together the best of all four regions of Thailand. Its signature dishes include Miang Kham, Yum Pla Duk Fu, Gai Hor Bai Toey, Goong Mare Nam Pow, Kae Yang, Khor Moo Yang, Tom Yum Goong, Gaeng Phed Ped Yang, Panang Kae, Poo Phad Phong Ka Ree, Pla Krapong Neung Ma Now, Phad Phak Bung Fai Daeng, Phad Thai Goong, Khao Niew Ma Muang – all to challenge the customers’ taste buds. 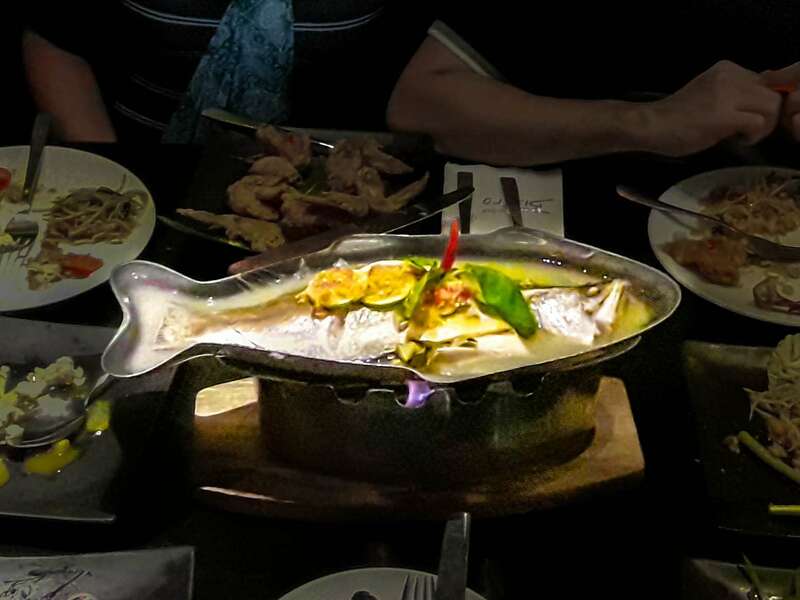 They are all destined to bring a true and unforgettable Thai cuisine experience. 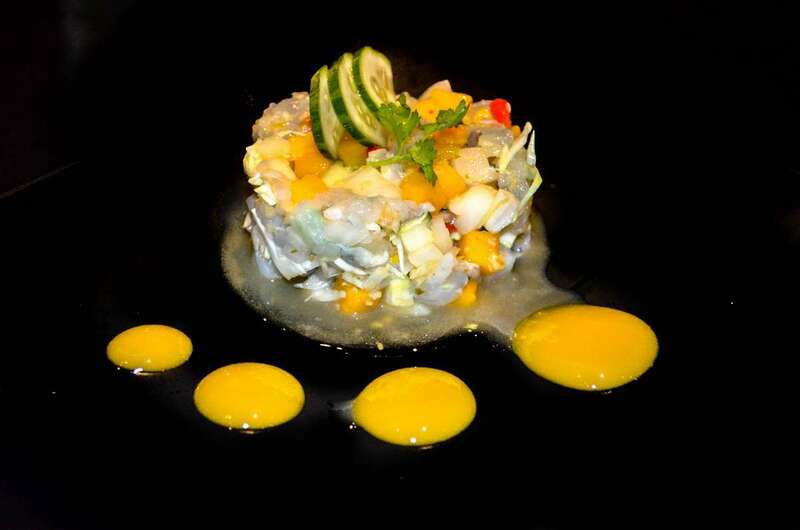 Mango Tree… Thai cuisine at its best. 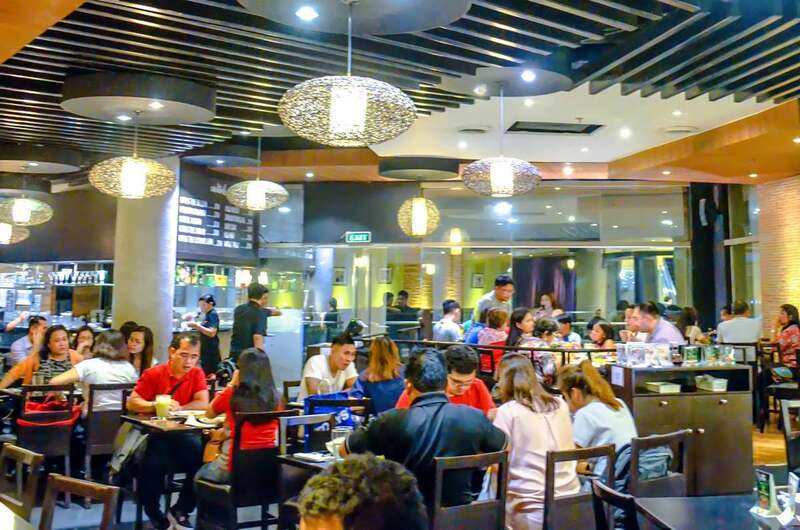 For more articles about restaurants in Trinoma, click here.